China Sanew Cable Co., Ltd. Here is High Quality Silicone Wire talking about Pay More Attention To The Danger Of Cable Fire. If you have any idea about Abrasion Resistance Cable, welcome to contact us and discuss. (4) Insulation breakdown of the intermediate connector box. The intermediate joint of the cable joint box is not tightly pressed, the welding is not strong, or the joint material is improperly selected. During operation, the joint is oxidized, heated, and flowed. When the intermediate joint of the cable is made, the quality of the insulating agent poured into the intermediate joint box does not match. It is required that when the insulating agent is poured, the air hole in the box and the cable box are poorly sealed and damaged, and the moisture leaks into the box. 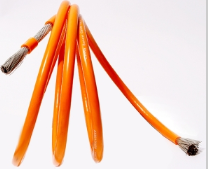 The above factors can cause insulation breakdown and short circuit, causing the cable to explode and ignite. (5) Cable head burning. Due to the moisture accumulation on the surface of the cable head, the cable sleeve of the cable head is broken and the distance between the lead wires is too small, causing flashover and ignition, causing insulation of the surface of the cable head and insulation of the lead wire. (6) External fire and heat sources cause cable fires. Such as oil system fire spread, oil circuit breaker explosion fire spread, boiler powder system or coal handling system coal powder spontaneous combustion, high temperature steam pipe baking, acid and alkali chemical corrosion, electric welding sparks and other fires, can make cables A fire has occurred.